Qigong, chi kung, or chi gung (pronounced CHEE GONG) is the science of cultivating the body’s internal energy which is called Qi in Chinese. It is a fundamental practice within taijiquan. The Chinese have been researching Qi for the last 4,000 years and have found qigong to be an effective way to improve health and to cure many illnesses. They have also found that it can help achieve mental and spiritual peace. A wide variety of qigong forms have developed within different segments of Chinese society. We offer a wide variety of classes in all forms of Qigong. Below are some brief descriptions and photos/videos of each style. Of course, the best way to get a feel for which one is right for you is to come in and try it out. Ba Duan Jin, or Eight Pieces of Brocade, dates back to the Song Dynasty (960-1279) and is broken down into eight sections, each of which focuses on a different physical area. With easy movements and impressive effects on the health, it is a gem in China’s health and fitness culture.Ba Duan Jin movements are gentle, slow, smooth and suitable for all ages looking for their first instruction of Qigong. It uses gentle breathing, stretching and strengthening movements which activate the Qi energy and blood circulation in your body. With regular practice helps to improve cardiovascular and respiratory system, stimulate your immune system, strengthen your internal organs, delays the aging process and finally give you abundant energy. Wu Qin Xi, or “frolics of five animals”, exercises was developed from the work of Hua Tuo, a leading physician of the Eastern Han Dynasty (AD 25-220) whose inspiration came from the observation of animals and birds. He came to the conclusion that wild creatures regularly performed certain exercises which can be replicated in order to build up and improve life skills. Wu Qin Xi movements are very gentle and are suitable for most people. The result of the scientific study shows that regular practice improves the respiratory and cardiovascular system; strengthens the limbs, flexibility and agility of the joints. Wu Qin Xi exerts an active influence on the people’s physiological functions, physical nature and state of mind. Tibet was significantly influence by Chinese and Indian cultures. Buddhism had a great effect, so the root of Tibetan Qigong is similar to that of Indian Buddhism. However, over 1,000 of years of research, the Tibetans have established their own unique style of Qigong meditation.With regular practice Tibetan Qigong can strengthen the immune system, clear energetic blockages, displace negative qi, improve metabolism and absorption of nutrients, improve balance and flexibility. With diligent practice Tibetan Qigong will also enhance creativity, intellectual power and concentration, as well as, provide a feeling of inner peace and compassion.The basic practices of Tibetan Qigong are easy to learn and well-suited for people at different levels of health and fitness. For example, some forms can be done effectively while sitting or lying down. The movements are gentle, simple and bring rapid results. Although the practices come from Buddhist traditions, one does not need to be a student of Buddhism to benefit from Tibetan Qigong. Tibetan Qigong is for everyone! 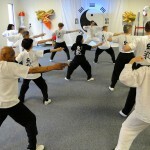 We also teach a variety of taijiquan styles. Please visit our Taijiquan Classes page for additional information. We also offer a variety of workshops in various styles and weapons. Please visit our Workshops page for additional information. 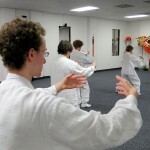 Private one-on-one lessons with Master Xing are also available. Call or email the school for details.